This show is awesome, this show is great, this show made me want dance like a loon. So much of my love for this show boils down to two things. The first is the totally awesome soundtrack, jam-packed with disco classics, from Chic’s ‘Le Freak’ to Donna Summer’s ‘I Feel Love’ and The Tramps’ ‘Disco Inferno’. The second is the pacing. There is almost no lull between songs, and the choreography is varied enough that it never feels repetitive. 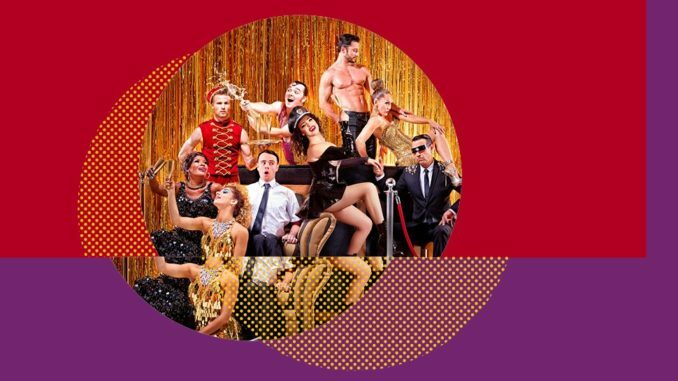 Directed by Craig Ilott, Velvet is wonderfully unpretentious – this show is all about grooves, both musical and muscular, as the athletic cast bound around the stage and over the audience. Reconfiguring Q’s Rangatira into a thrust theatre, Velvet feels like a Vegas show, in the best possible sense. You get flashing lights, muscly abs and lots of sequins. The real star of the show is musical director Joe Accaria. He plays a variety of percussion throughout the show, augmenting the soundtrack’s bass without overwhelming the songs. Craig Reid is an easy highlight with his Hula antics, but there are no weak links and everybody gets a set piece (or three) to show off their respective talents. Tom Oliver and Marcia Hines have great voices, while Mirko Kockenberger, Emma Goh, and Stephen Williams do some jaw-dropping things with their bodies (and all in time with the music). I don’t really have any criticism of the show. There were points where singers Kaylah Attard, Rechelle Mansour, and Marcia Hines were drowned out, but when everything is so good, it does not matter. If you like music, fun and objectifying the male body, go see Velvet. It is the most fun you will have before Christmas. Velvet plays at Q until Oct 1.